The Cato Institute recently hosted a forum on the question, “Is College Worth It”? Featuring Bryan Caplan, Professor of Economics, George Mason University, and Adjunct Scholar, Cato Institute; Beth Akers, Fellow, Brown Center on Education Policy, Brookings Institution; and Neal McCluskey, Associate Director, Center For Educational Freedom, Cato Institute; moderated by Chip Bishop, Director of Student Programs, Cato Institute. Soaring tuition and student debt, the rise of high-tech alternatives, and a persistently sluggish economy have provoked a startling question: “Is college worth it?” It’s a question that raises many others: Must I go to college to learn skills I’ll need for my career? Is just getting a degree — any degree — the key to my future prosperity? Should higher education be about marketable skills, or is it about personal fulfillment and expanding human knowledge? These questions disconcert students, parents, and taxpayers alike…. According to Caplan, who took the podium first, approximately 55% of the college wage premium is attributable to the college degree. The individual student is actually responsible for a significant percentage of the higher wages attributed to college graduates. College grads typically arrive on campus with big labor market advantages. The typical college grad was unusually employable even before they started college. The choice of major and the probability of graduation are two important factors that influence the college premium. 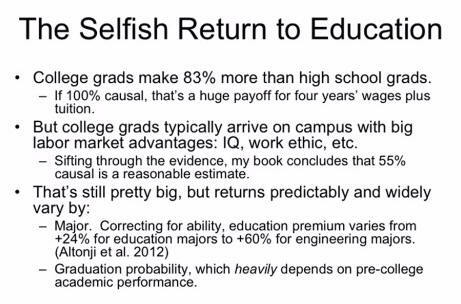 Caplan also discusses the “concert effect” caused by the growing rate of college completion. Similar to what happens at a concert when some members of the audience stand up, everyone else has to follow in order to enjoy the performance. Can you see better when you stand up? Not really, but you are forced to stand because everyone else is doing the same. Does a college degree make you a better employee? Not really, but we feel compelled to go to college because “everyone” else is doing it. The forum podcast is available at the Cato site. More topics are covered, including the sheepskin effect, why college professors never have to check IDs, and how college is a four-year party for most students.